There is good news for those who enjoy paper and print! An article in the recent November 2013 issue of Scientific American magazine clearly supports what we already know: most people understand and remember text better when read on paper rather than a screen. According to the article, while e-readers and tablets are becoming more popular as these technologies improve, reading on paper has many advantages. Since the 1980s, there have been more than 100 comparative studies in the United States, U.K. Taiwan, Sweden, Norway, France and Japan to explore differences of how people read and comprehend on paper versus screens. While technology has continued to improve, it still hasn’t reached the comprehension level of traditional paper users. What we have learned from these studies is that readers prefer real paper over its electronic counterpart and achieve high levels of comprehension and retention with paper. While there are obviously several advantages to using digital technology like being able to access an abundance of information at any time from one device or being able to conveniently travel with a number of different resources in one digital location, paper is still more conducive to learning. And e-readers fail to re-create certain tactile experiences of reading on paper, the absence of which some find unsettling. 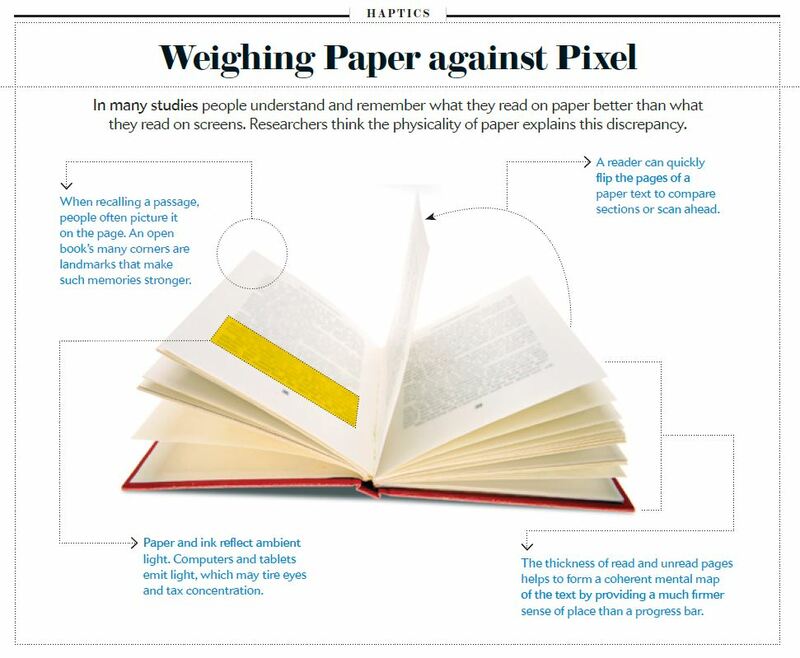 The graphic below helps to weigh paper against pixel with some compelling points. Source: Scientific American – November 2013 issue. Paper not only has inherent environmental features such as high recyclability, carbon storage, and a renewable primary raw material (wood, recycled and alternative fibers), it also fills a key societal role by helping readers create their own unique experience whether it is through learning and study habits or getting personally involved in a work of fiction. It is less distracting and allows the reader to focus on the text. The absence of multi-tasking leads to a greater understanding of the subject matter and in turn creates a memorable experience. Check out the article for yourself. It goes into great detail about why the brain prefers paper and how the human brain interprets written language, perceives text and constructs a mental representation of the text that is similar to the mental maps we create of terrain and indoor spaces. Do you prefer to read on paper or screens? Click here to take the Scientific American poll. President, Two Sides U.S., Inc. I agree in certain circumstances that the brain cognitive load would be less with paper. However it really depends on the task at hand that would determine the best medium. Paper for a novel, but definitely not to review, cross check a budget and then send it to a colleague on another continent for example. Electronic formats make our lives easier and reduces strain in other ways than just reading. The full title of the Scientific American article is “The Reading Brain in the Digital Age: Why Paper Still Beats Screens” – the key here being “Reading Brain”. It is not looking at the brain and response to the digital eco-ecosystem in which electronic documents exist. I would argue that the digital ecosystem of which digitised content, that was traditional paper, makes allows us to perform better all round – that makes for more satisfied person (with a happy brain)! Interesting piece. I read it on my ipad! on December 4, 2013 at 8:59 am | Reply Why the brain prefers paper | ecolor Printing, Inc. Very apt. Still prefer the ink for a plausible & effective reading. Speaking of ‘mentally taxing’, why do you have a ‘snow’ effect falling all over this web page…? on December 5, 2013 at 10:31 am | Reply Two Sides U.S.
Good point about the snow….I will put an end to it now. Wish I could do the same outside my office window!! If our levels of comprehension are higher when we read printed material are we making a mistake giving school age children tablets instead of books? on December 5, 2013 at 1:14 pm | Reply Two Sides U.S. In my opinion “yes”…primarily because we do not fully understand the impact on learning and education. We are switching the kids to the latest technology without fully understanding the impact. One can nearly always get evidence to support any side of a position. Here is an article that says that iPads are better than other methods in educating students in science and other subjects. The article says, “These devices let students manipulate virtual objects using natural hand gestures, and this appears to stimulate experiences that lead to stronger learning.” Ipads are good for looking at objects but the article doesn’t say anything about reading on an Ipad. The point is that it neither position (paper or digital) is better than the other. it depends on the subject matter and demographic of the information consumer which is preferred. It is a often a practical or personal choice in how we consume information. The market of digital books and e-readers has not surpassed paper publication. However I suspect the majority of every new generation is leaning more and more towards digital. This type of debate, even though it involves reading and the written word, is best done digitally on this forum. I prefer paper, but the multiple benefits of an e-reader far outweigh that preference. Pundits are often quoted by journalists on a deadline and seeking drama. With respect to the present subject we have been offered predictions that books will soon disappear yet we know the situation is overstated. I suppose at the advent of TV some pundit was certain that radio would disappear yet it persists as an important media, albeit no longer dominant. We should avoid the either-or fallacy. We as publishers are presented with multiple formats/media for delivery of various texts (text, images, sound) and should make our selection based on best-use. If we try to advocate for always paper or always electronic files then we will be often wrong. on December 9, 2013 at 3:05 pm | Reply Two Sides U.S.
Paper is better to use for reading, however, digital medium is better for filing. Excellent article. Thank you. Great reference for creative firms. If feel as a general premise – Paper communicates, digital documents inform. Long live the use of paper! Long live the freedom choose how we consume our information. I fully agree with the content. And what about environment issues? What about problems of recycling e-books in the future? We konw how recycling of PCs and all the other electronic staff is done in India and Africa. What a bad image it gives about the treatement of our planet and the humans. What a pleasure reading a book, feeling the paper in my hands, when the book is new it smells (and i don’t mean the printing inks), the rustling when you turn the page. Reading a book is involving your senses, it calms you down and unless the story is exiting (or the scientific content is) you stress down. on May 13, 2014 at 12:40 pm | Reply Paper vs ebook | tmfeuka - who is she really? on June 24, 2014 at 12:52 pm | Reply Scientific American: Why the Brain Prefers Paper - Industry Analysts, Inc.